Soft contact lenses represent over 90% of new fittings, and presbyopic correction is an increasingly important part. While monovision remains a significant part of this segment, generally its role has decreased over the years in favor of an increasingly optimized and diverse portfolio of soft multifocal contact lenses. 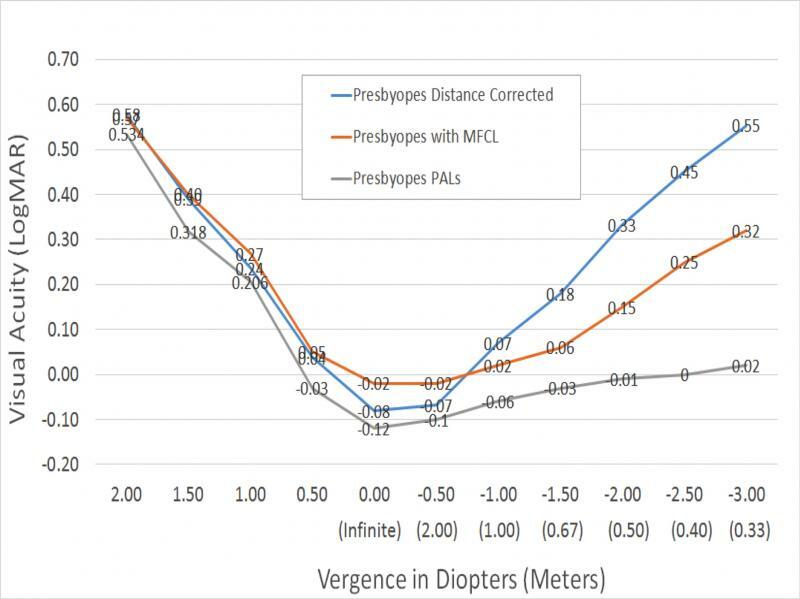 New concepts in power distribution across the lens, and modeling of the visual performance as a function of the numbers of near and distance zones or the percentage of the area covered by either part, are bringing new expectations for the multifocal contact lenses of the future. Figure 1. Trends in presbyopia CL fitting (monovision or multifocal CLs) in candidates with 45 years of age or older. 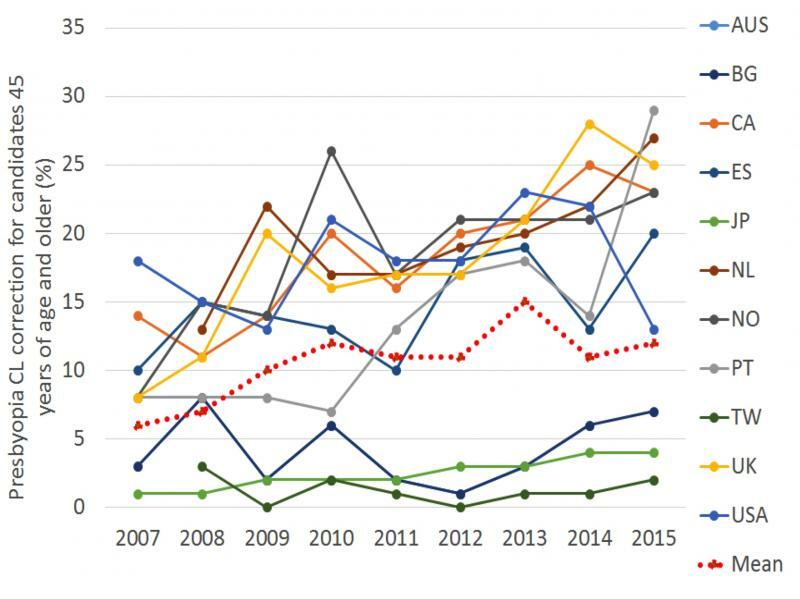 Source: International Contact Lens Prescribing Consortium 2007-2015. Legend: AUS: Australia; BG: Bulgaria; CA: Canada; ES: Spain; JP: Japan; NL: Netherlands; NO: Norway; PT: Portugal; TW: Taiwan; UK: United Kingdom; USA: United States of America; Mean: Average for the 32 to 35 countries considered in the Consortium. Knowledge has increased over the last few years regarding the optical characteristics and visual performance of multifocal contact lenses, allowing us to make more informed decisions for our presbyopic patients. Now the relationship among the optimal power distribution across the optic zone, the pupil size, the inherent ocular aberrational and residual accommodation, and the visual benefit achievable is much clearer than before. Careful analysis of the defocus curves allows us to determine how vision will be at distance, intermediate and near, while assessment of dysphotoptic phenomena (i.e. halos, glare, starburst) ﻿might help to better understand the challenges of the initial adaptation period. 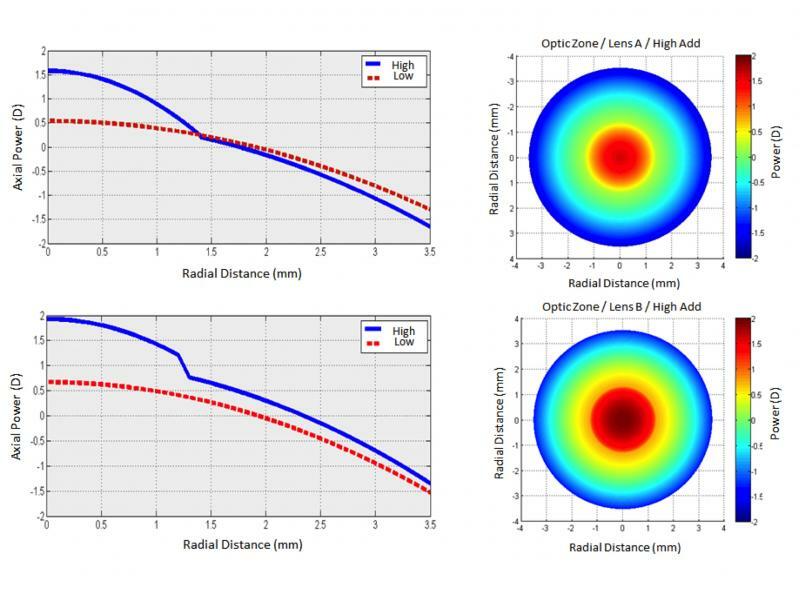 Optimization of the material properties and the manufacturing processes is a crucial step to ensure a more precise match between the predicted performance during the lens design phase and the actual behavior on the eye. Advances in presbyopic contact lens designs are increasing our understanding of the interactions of the ocular and lens characteristics. While improving the overall performance of the disposable lens designs, this opens a window of opportunity for custom-made contact lenses optimized for the patient’s ocular characteristics in terms of corneal topography, ocular low- and high-order aberrations, pupil size dynamics and residual accommodation. Even if difficult to implement from an industrial standpoint, such an exercise will be worth the effort to explore the potential of current multifocal optics technology applied to contact lenses mainly based on aspheric multifocal or concentric bifocal designs. Current approaches in material science, lens design, manufacturing and clinical assessment make multifocal soft contact lenses a promising solution for presbyopia. This, combined with the current demographic trends in most developed countries, will fuel the future of contact lenses as a whole segment. In other words: the answer to the question raised in the title is “Yes, please.” A large group of emerging presbyopes are waiting for better solutions; they will be forever grateful for the options provided in the (near) future. Jose graduated with Honors in Optometry at the University of Santiago de Compostela in 1998, followed by a PhD in Sciences (Optometry) in Portugal at the University of Minho in 2007. 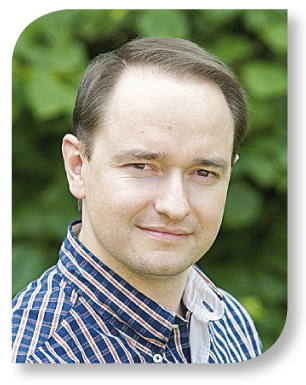 He is currently an Associate Professor with habilitation and Vice-dean of the School of Sciences at the University of Minho, Portugal. He published over 130 papers in peer-reviewed ISI journals with impact factor cited over 1500 times (ISI WoS H-index=20) and is author of three books related to contact lens practice. Member of the International Society for Contact Lens Research (ISCLR); Spanish (GCOO); Portuguese (APLO) associations of optometrists and a fellow of the American Academy of Optometry. Reviewer for 10 different Scientific Journals indexed in ISI Web of Science including Optometry and Vision Science, Ophthalmic and Pysiological optics.